The Sunflower Superjam 2012 was a once-in-a-lifetime event that you can now experience with the release of the DVD, due on September 16. On stage together for the only time, you can watch Alice Cooper, Brian May (QUEEN), Bruce Dickinson (IRON MAIDEN), John Paul Jones (LED ZEPPELIN), Ian Paice (DEEP PURPLE), Mark King, Alfie Boe and a host of other exceptional musicians "jam" at the Royal Albert Hall, making the iconic London venue rock like never before. 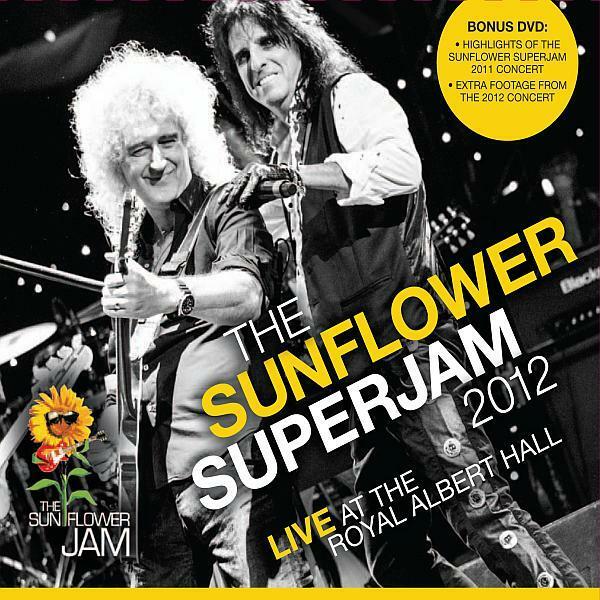 Plus, enjoy the Sunflower Superjam 2011 on the bonus disc with performances from DEEP PURPLE, Rick Wakeman, Joe Bonamassa, Newton Faulkner and including the last live performance from the legendary Jon Lord (DEEP PURPLE). Produced by The Sunflower Jam charity, all monies raised will go directly to supporting the research and application of holistic and non-toxic treatments for children and young adults suffering from cancer. For more information, visit TheSunflowerJam.com. Fan-filmed video footage of the 2012 concert can be seen below.